Lovely spacious villa. Nic the owner could not do enough to make it an enjoyable holiday. 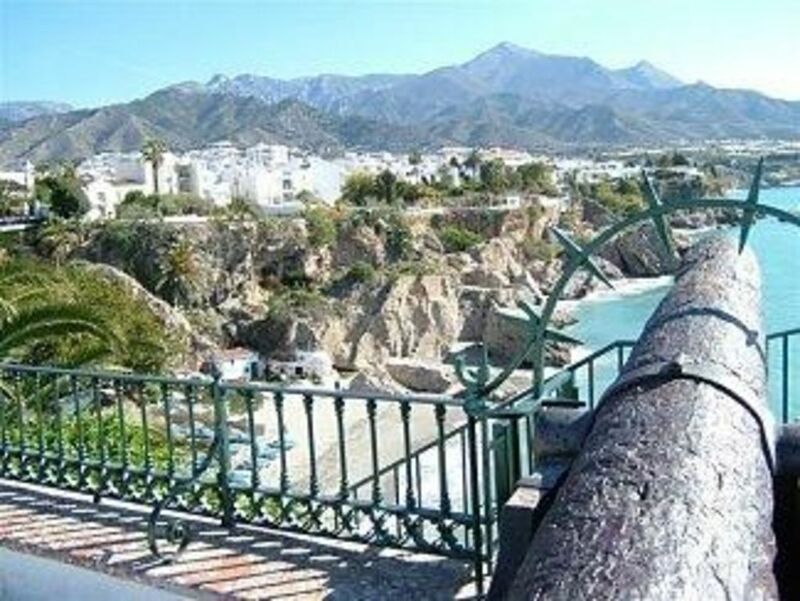 The villa in El Capistrano Village Nerja has full cooking facilities, a lovely bathroom with a superb walk in shower. Large bedroom and enclosed garden. Nic organised a taxi to and from the villa and although we had a couple of blips he had given me his home and mobile number and immediately responded to my query. Linen changed weekly by friendly people who left a note to let us know exactly when they would be calling We will definitely recommend him to friends and family and would not hesitate to use the villa again if we go back. We had a fabulous stayed in this villa for two weeks, end of Sept to Oct 2018. Nic and Nancy greeted us on arrival to show us around and provide useful information. The apartment was clean and tidy with a amply equipped kitchen providing us with all our needs, I cooked simple meals most nights. Cool spacious bedroom and posh new bathroom. We enjoyed sitting out in the pretty walled garden most days and before heading off to one of the villages pools to cool off in the afternoon. There are plenty of places to eat and drink within 20 minutes walk, plus you have the cave bar on site with their 'happy hour' providing good value for money. El Capistrano village is lovely and charming with white walled villas, gardens and tiled walkways. Not a problem for us but there are a few steps around and the village is up hill from the beach and town. A new Mercadona supermarket 5 minutes walk across the road provided all our food needs. A visit to Frigiliana is a must and well as a refreshing hike up the Rio Chillar. We are certainly planning to return to this area again in the future and wouldn't hesitate in rebooking this villa again. This was a fantastic holiday. Booking was a breeze and the transfers went without a hitch thanks to the owners, Nic and Nancy. The pueblo was perfect for our needs. Extremely clean. Air con in both living room and bedroom. A beautiful secluded walled garden which had the sun all day. A fabulous bathroom with a rainfall shower to die for. Perfect location for the bus into Nerja. There are also two supermarkets within easy walking distance. Perfect Place and I wouldn't hesitate to book again. Thank You!!! Nic et Nancy sont très agréable et présent juste ce qu'il faut en cas de besoin. L'appartement est propre et agréable avec une grande chambre pour 2 et un canapé lit dans le salon. Avec la clim dans la chambre et le salon, pas de problèmes même en cas de fortes chaleurs comme c'était le cas cet été pendant notre séjour. La piscine privée (partagée avec les locataires des appartements de Capistrano Village) se trouve à 3 mn à pieds et est très bien entretenue. La terrasse de l'appartement est spacieuse et permet de faire sécher le linge et de passer de bonne soirée "à la fraîche". Le supermarché est juste de l'autre coté de la rue, très pratique et on y trouve de tout. Les plages les plus proches sont à 20mn à pieds, on descends tout le long, donc il faut ensuite remonter mais ça se fait bien surtout lorsqu'on fait une halte prolongée par les rues de Nerja, les boutiques et restaurants à tapas. Belles balades à faire dans les environs mais pas en plein été car il fait trop chaud et la température ne baisse guère la nuit. Nous étions déjà venu à Nerja en octobre, c'est plus propice pour partir dans les montagnes avoisinantes. We really enjoyed our stay at pueblo 48. It felt like home from home. El Capistrano is very pretty and well maintained and clean. The apartment was lovely. Spotlessly clean with very large bedroom, lovely shower room, lounge/kitchen/diner and pretty garden with grape vines growing. The air con was very efficient and not noisy although you can use ceiling fans if you want to. The location of the apartment is really good near the pools, which are lovely, car parking and two supermarkets. We loved using the fresh orange juice machine in Supersol. Nerja has a great atmosphere all day but especially at night with lots of restaurants, cocktail bars and tapas bars. A few miles away is the pretty village of Frigliana which has lots of character. There are lots of beaches in Nerja and surrounding coastline. El Canuelo is lovely with three beach bars and you have to get the bus down to it once parked. The beaches are dark sand and pebble. Nic and Nancy are a lovely couple who genuinely love El Capistrano and Nerja and do everything possible to ensure you have a lovely time. We rang nic from the airport and he gave us directions to get to El Capistrano which were easy to follow and they met us when we got there and showed us around. It was nice to know they live nearby in case of emergencies. We stayed for 10 days and half way through nic bought us some clean towels which was great. They then met us to say goodbye and swap notes on restaurant reviews. We would definitely stay with them again.